Building an impressive portfolio is the first step in establishing your presence as an artist on the virtual platform. If you are among those who believe that the presentation of your work doesn’t matter as long as you’re delivering quality, then you need a reality check. Quality matters, yes, but that in no way means that one can compromise on the aesthetics of the way you showcase your portfolio online. A well-designed portfolio automatically enhances the appeal your website thereby attracting more clients to check your work. Recommendation: check out also PREMIUM portfolio WordPress themes collection by WebCreate.Me for building up your online showcase! WordPress.com (which is different from WordPress.org) is a well-known blogging platform that supports and promotes budding web entrepreneurs in setting up their websites and blogs online. A robust, responsive and reliable option, WordPress now also offers various marketing solutions and can is among the best SaaS options for creating online portfolios. Other than free web hosting and domain registration, WordPress can also be used for creating fully fledged portfolios, an amazing feature for photographers, and other artists who want to showcase their talent on a global scale. Flatolio, Slider and WP Metro are among the few themes that are compatible with portfolio framework. Vibrant and user-friendly the themes come with a point and click interface that’s easy to understand. Also, the themes run wonderfully on all devices. Squarespace has been around for almost a decade now, providing top notch e-commerce solutions to entrepreneurs worldwide. However, the platform is an equally competent candidate for web hosting and blogging. The SaaS-based CMS integrated website builder also offers users the option of building their own portfolios and displaying their work online. The convenient drag and drop interface clubbed with the extensive archives of vibrant graphics and custom-made layouts only simplify your job and save on time. You can even share your portfolio across popular social media networking sites such as Twitter, Tumblr, and Instagram for more viewership. The portfolio app available for iPhone models helps users access portfolios even when offline. Squarespace is a multi-purpose platform that allows you to build, create and promote the e-venture globally. Viewbook is a rising portfolio platform that has quickly gained a strong foothold in the market of portfolio website builders due to its intuitive interface and hassle-free design. A lot of professional photographers have already registered at Viewbook, sharing pictures, building vibrant portfolios and registering their domains online. It is a clever presentation tool that comes with an interactive image creator and smart editor for creating websites, portfolios, and projects in minutes. It works well on all Windows, Android and Apple devices allowing users greater freedom of action. The application for iPhones even gives you the provision of creating portfolios offline. With the cloud backup, you can rest assured that all your projects are secure against all online threats. Moreover, the latest plug-in by Viewbook allows users to directly transfer the photos from Adobe Lightroom. Any discussion on online photography platforms would be incomplete without mentioning Adobe, yes the name has become a household entity and is today almost synonymous to photo editing apps. Adobe is one of the leading digital photography firms in the world, Adobe Illustrator, Adobe Flash, Adobe Photoshop and Adobe Lightbox are among the best- known products launched by the company. The latest addition to that list is Adobe Portfolio, a place where artists and photographers can build customized portfolio designs and showcase their talent to the world. There are about five different and unique themes to choose from, each of them compatible with Behance, a top rated website builder. The users also get access to Adobe Typekit from where you can use a number of interesting fonts. Moreover, the live editing features allow users to make real-time changes to the content. Fabrik, another leading name in the industry aims at providing the best image editing and presentation tools that enhance the quality of the pictures tenfold. The sleek, sophisticated framework armed with a set of professional tools assist artists in transforming their unique ideas to reality. The innovative themes, colorful images and a wide range of graphics further help you stand out from the crowd and capture the interest of the audience effortlessly. You can share your work on other platforms as well for better exposure. There are six different and unconventional themes to choose from, each professionally designed and easily customizable to your requirement. You can even tweak the basic HTML coding and CSS stylesheets if you have a knack for coding and web designing. Cargo is the ultimate portfolio builder that has been in business since 2009. The place is home to designers and talented artists who want to present their work in an attractive yet systematic structure. This Saas based platform comes with inbuilt CRM and SEO improvement solutions along with several e-commerce tools that can increase your web appeal immensely. Cargo includes more than 30 customizable templates that can be edited just the way you like it. Moreover, you can also tweak the HTML coding of your website if you have a basic knowledge of web designing. Here, users can also configure cloud-based images, display picture slide shows, and stream video content. The platform works well with all Android, Mac, Windows and Apple powered devices. Format is among the top names that strike us when we think of a competent portfoliovplatform. From presenting photographs to editing the layout and modeling the entire structure of the portfolio, you can do it all here. The format is a beautiful platform specially built for artists and professionals in the creative field. The standard themes come with a variety of layouts and graphic options to choose from. Also, at Format users can edit and apply the changes to their portfolios in real-time i.e. when they are live! You even get to customize the HTML coding and CSS format of your website if you have the required technical skill. At Format, users even get the option of directly streamlining your work directly to the clients from within the portfolio. Wix is a popular name among web developers and entrepreneurs, well known for its powerful marketing and cloud services. Wix aims at the big picture, the core team of developers assist users in building almost any kind of e-platform. The flexible and versatile solutions offered here accommodate the most unique of customer demands. There is nothing that these guys aren’t prepared for! The drag and drop editor, mobile-friendly interface and a list of over 500 themes and 40 different widgets make the entire portfolio creation process all the easier and fun. The DIY functionality of the platform allows creative freedom of action that is so necessary for an artist. Carbonmade is among the simplest and most user-friendly portfolio builders currently circulating the market. Set in New York, the platform was developed by a designer who was dissatisfied with the site builders he was working with as it couldn’t publish illustrations. The platform now boasts of a wide range of projects. From organic home-based assignments to professional large-scale undertakings, Carbonmade deals with it all. The team offers users a unique combination of vibrant themes and smart marketing solutions that are best suited for creative artists and photographers. All the themes can be personalized according to requirement. The platform works well on all devices, the cloud services are an added perk. Free domain registration, effective content protection, and high-quality video content support make the platform a general favorite among web developers. Virb website builder is not limited to designers and the creative folk; here almost anyone can build their portfolio if they have the content and ideas. With unlimited access to photos, videos, and web analytical tools, the platform is every web developers dream destination. Here, you even get free web hosting and domain registration services along with cloud storage, CRM tools, and e-commerce solutions. The mobile-friendly drag and drop interface is flexible and functional. Also, at Virb users can configure the HTML code and meta tags of the website in the “advanced” section. The World Wide Web has sure come a long way from the yesteryears, back then the internet was only used for communicating with your friends and downloading free music. Today, the platform has become a huge marketplace where hundreds of entrepreneurs set up their commercial ventures in hopes of better profits and international exposure. Website builders have gained immense popularity among users who want to build their own websites and portfolios but lack the technical expertise and coding knowledge for designing them the conventional way. 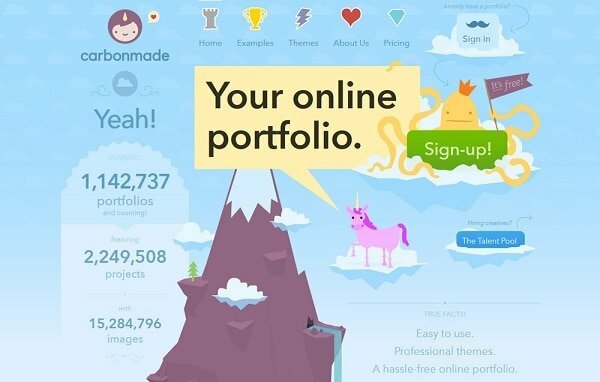 The portfolio platforms mentioned above have all the necessary features required for building an interesting portfolio. However, there are other equally deserving names that couldn’t be included in our list. Consider the size and scale of the content before you make a choice. Has anyone tried Pixpa? I’m finding it to be more intuitive than Squarespace. Just wanted to make sure it has the option of order-fulfillment and private galleries.